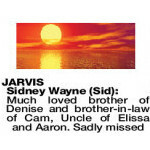 In loving memory of the best Dad in the world. Rest easy Dad. Jaiden and Katelin. 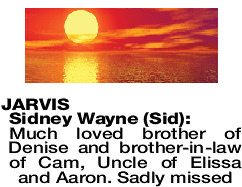 A Service to celebrate the life of Mr Sidney Wayne Jarvis of Kendenup will be held at ALLAMBIE Park Cemetery, Albany on FRIDAY (05.04.2019) at 1.30pm. 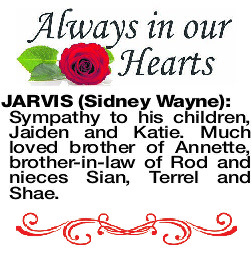 JARVIS SIDNEY WAYNE Sympathy to his children, Jaiden and Katie. Much loved brother of Annette, brother-in-law of Rod and nieces Sian, Terrel and Shae.